Earlier this month we visited Copenhagen for our friends’ wedding. The bride and groom being foodies and travellers too, we had the happy opportunity to sample some great Danish food as part of the wedding celebrations! Wedding done on Friday, we also took advantage of the weekend that lay ahead to do a bit of foodie travelling. Chilly winds notwithstanding. A bout of food poisoning notwithstanding! Let’s get the setting straight first. Copenhagen is relaxed, so relaxed, you’re in a sort of sleepy lull a lot. Straight out of London, this feels very strange. You find yourself waiting for cars and cyclists to come speeding down the street (presuming they’re all waiting at a red light somewhere), you brace yourself for some shoving and swearing at pedestrian bottlenecks on tight streets, you expect loud voices and horns and the hustle and bustle of a city, but none of it ever happens. Instead you’re in the midst of broad roads, colourful buildings, a winding canal, quirky cafes, so many restaurants and so much al fresco brunching and lunching and dining. And though there are people and activity around you, it’s all very sedate. Don’t go expecting the vibrance and bonhomie of Mediterranean Europe - it’ll be a bit of an anticlimax. 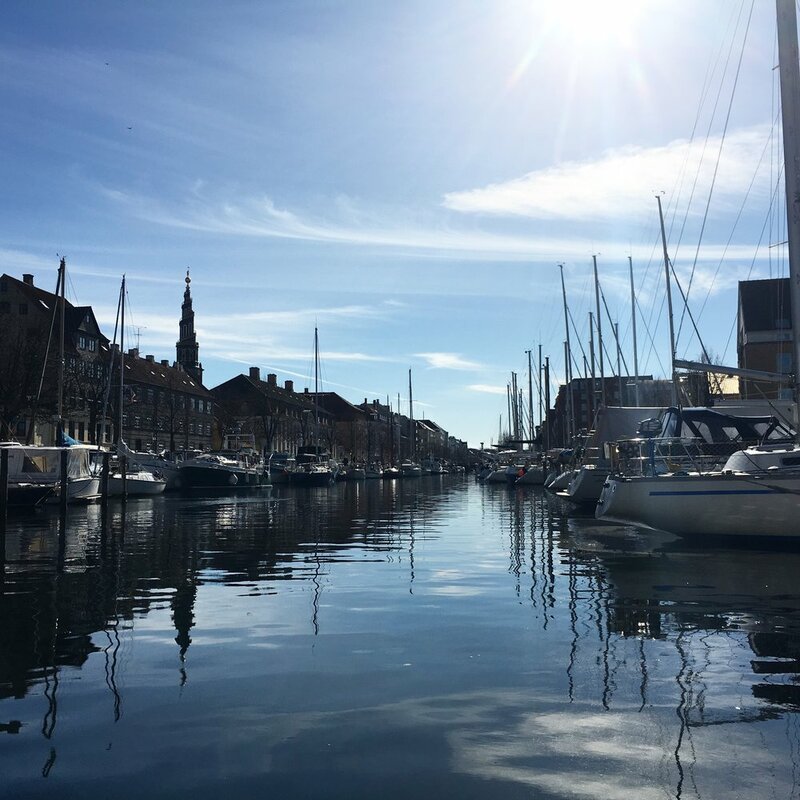 Instead, expect to chill, to spend hours on a boat, hours on a cafe sofa with cake and coffee, hours ambling down streets (cobblestone, narrow and charming in the older bits of the city), hours people-watching in colourful Nyhavn, and hours lusting after gorgeous furniture in shop windows. I reckon this slow-paced life inspires creativity; the city is replete with lovely boutique stores. And creativity and free living are stretched a little further in Christiania - a collectivist, weed, graffiti and Bob Marley loving hippie commune that lives by its own rules (literally). In the Green Light District in Christiania, the law is simple: no photos, no running (it causes panic), have fun. You must visit Christiania, and you must rent a boat and spend at least a couple of hours exploring the waterways. And if the weather is good, you must rent a bike and explore Copenhagen’s most colourful streets (we walked a few instead), and visit the flea markets (we managed to squeeze one in, by pure chance, and I got us a ceramic tile to add to our wall project, woop!). You must also climb to the top of the spire at the Church of our Saviour for a breathtaking view of the city. And If you’re a foodie with a big budget, I bet you’d want to go to Noma too; touted one of the world’s best restaurants! On that note, let’s talk about the food in Copenhagen. Four things stood out - rye bread, hot dogs, modern Danish food at Tarnet, and danish pastry and cakes. We didn’t have the famous open sandwich - smorrebrod - only because we didn’t have time and Amman’s (where we wanted to go) airport branch did not appear to have staff inclined to serve us! So rye bread. Rye bread is a high-fibre slow energy release bread made from rye grain flour. Often rye grain is mixed with other grains and seeds to give you a multigrain bread. Pure rye bread is dark and dense and has a strong flavour, and you really can’t have too much of it. So a thin slice with assorted toppings is perfect. We bought a loaf back from Copenhagen - it is delicious but proving very difficult to get through. I like it grilled with some mature cheddar melted on top. When we were in Denmark we had a delicious chicken, avocado and mozzarella sandwich at Kaffe Lladro. I believe rye releases heat to keep you warm, and in the cold Nordic climes this is therefore a popular choice. Hot dogs! The Danes love these, and there are stalls everywhere. Again, it’s very likely it’s the toasty after-effect of the high fat content that’s the reason for their popularity. You get various kinds of sausages in Copenhagen, and you can have them on their own with all sorts of sauces, or in a little pocket of bread. We skipped the stands and went to Harry’s Place instead. An unassuming shed of sorts jam-packed with big burly dudes chomping solemnly on sausages and meatballs. The sausage was fantastic, we mopped up plenty of mustard and ketchup and fried onion with it too. Definitely recommend going to Harry’s - it’s a little out of the way, but worth it. It’s also really close to Norrebro where there’s a great flea market every Saturday (Norrebrogade flea market). We confused this market with another one close to the station unfortunately, so missed out on the real thing. Don’t make the same mistake! Then onto Tarnet. Tarnet is a new restaurant on the top floor of the Tower at Christiansborg Palace. Tarnet serves modern Danish food, and what a delight our dinner there was. I feasted on seafood - raw scallops for starters and salt cod for mains. The juiciest scallops and the softest flakiest fish I have had in a long time. An absolute treat for the taste buds. And dessert was three pieces of chocolate with an increasing percentage of cocoa content, and three corresponding helpings of mousse. And a berry sorbet to balance it all out. Blew my mind. We watched the Copenhagen lights come on at twilight from the viewing platform on the tower, and that was a very lovely precursor to the meal. The fourth foodie highlight was eating in the snug cafes that Copenhagen is so well known for. They all look so warm and inviting, and they’re each so unique in style. We peered into 5, and found a seat in 2 over the long weekend, once for brunch, and then for breakfast, and then back again to the first one for some downtime before we headed to the airport for our flight back. The best thing about these cafes is that you can sit around for as long as you like - people spend hours working on their laptops or reading we noticed - and there is great coffee on offer. There was plenty of cake and great sandwiches at Kafe LLadro, and yummy French toast and waffles at Cafe Taenk too. The cafe culture is so integral to the big chill that Copenhagen is all about, and you really mustn’t come away without enjoying it for yourself. Another spot I want to recommend is the cafe at the Museum of Architecture. More for the ambience than the food, though the food was tasty too. You eat in a glass balcony overlooking the canal and its very nice indeed and a quiet change from the busy Nyhavn restaurants. But of course, nothing compares to a packed lunch and blankets on a boat, on a sunny day, as you wind your way around the city. Utterly peaceful. What are your favourite spots to eat in Copenhagen? Have you read about my other food travel stories?